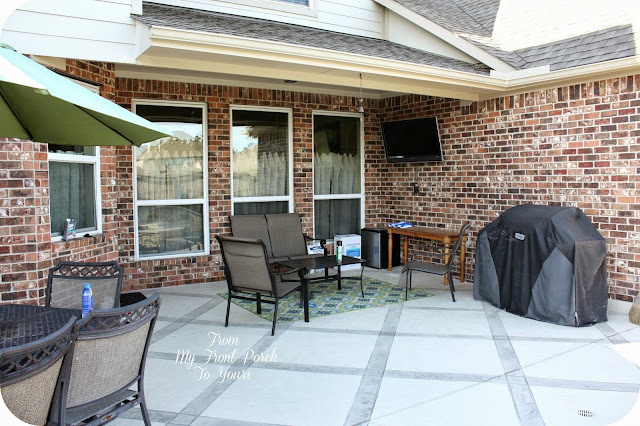 Since it is now Oct. 1 I figured I would go ahead and share our backyard makeover! ;) Honestly I was waiting till I had everything on the porch picture perfect but that has not happened yet. Here is what our view looked like before we began the pool process. This was probably 3 and half years ago when the swing set was new. You can see more Before pics here. This is our view today! Sitting area off to the side. The Crepe Myrtle we planted is having a time trying to adjust. We have not lost hope yet though because it is still getting buds on it. This area is the tanning ledge. It is not very deep at all and is where our little Savannah enjoys hanging out at when we are in the pool. You can not see it but there is bench seating on this wall. We decided on French Grey for our Pebble Sheen color and it was the perfect choice. The color of the water changes depending on which way the sun is hitting it. Here it looks like a deep blue. This area is what was holding me back from sharing the reveal. I have decided that the new rug is just way too small and I prefer cushioned furniture here instead so come the spring this area will be made over. It is not very inspiring at this time but we love it and hang out in this space all the time. This area needs some help as well. I am going to be making some shutters for the window. I may even swap furniture around and set this area up to have the fire pit instead. We are immensely enjoying our new pool! If you have been debating over whether to get one or not I say go for it! We wish we would have done it a few years back. If you missed the pool progression here are the links so you can see exactly what went on and my inspiration. "Oasis" is an apt description! It's all so beautiful. Hope you get lots of sunshine-y days to enjoy it! What a gorgeous pool! 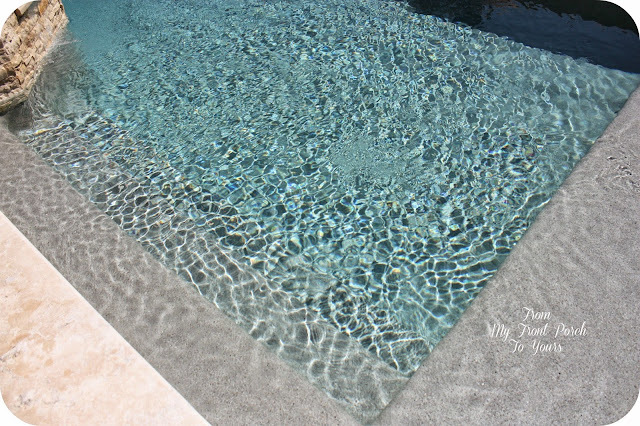 Love the color of the tile wall, decking and of course, the blue bottom of the pool. My parents had a house in Palm Desert with a pool and we enjoyed many weekends there with our daughters when they were young. 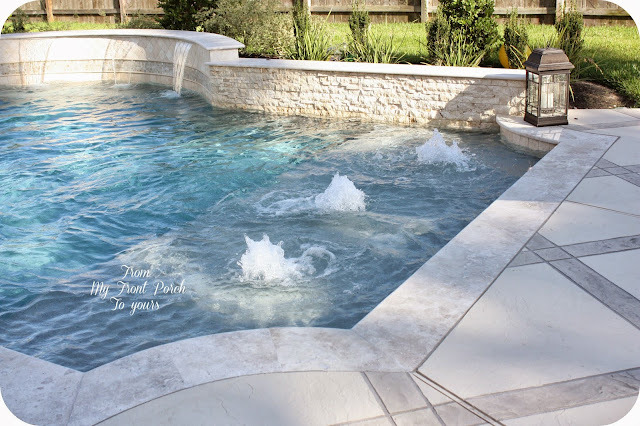 I love your pool...the cool gray stone surrounding it and the water color...so serene...the perfect oasis. 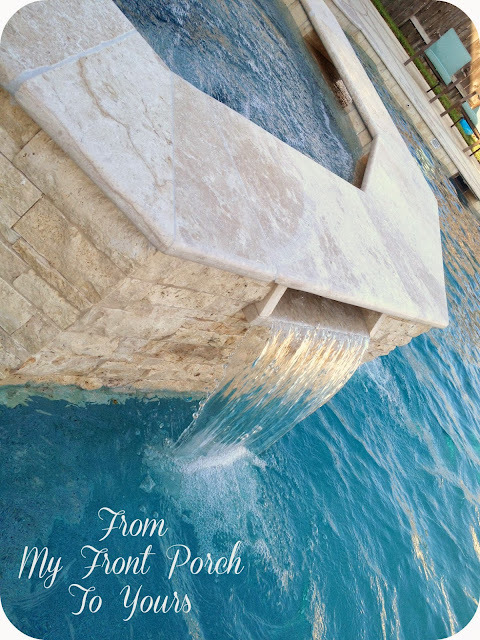 WOW, what an amazing pool Pamela! 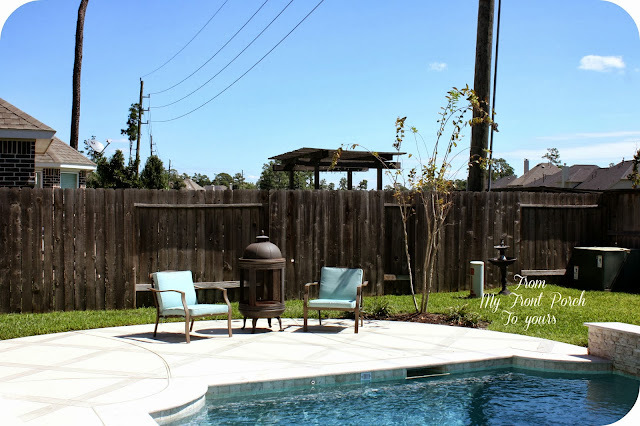 Just love your backyard oasis. Your family will have so many fun times there...so happy for you!!! You might have to change the blog name to My Back Patio to Yours, cuz I'm coming over to tan on the ledge! Love the pool area and I can see why it's your favorite spot to hang out. I would probably be sleeping there also LOL. Thanks for sharing your lovely pool. 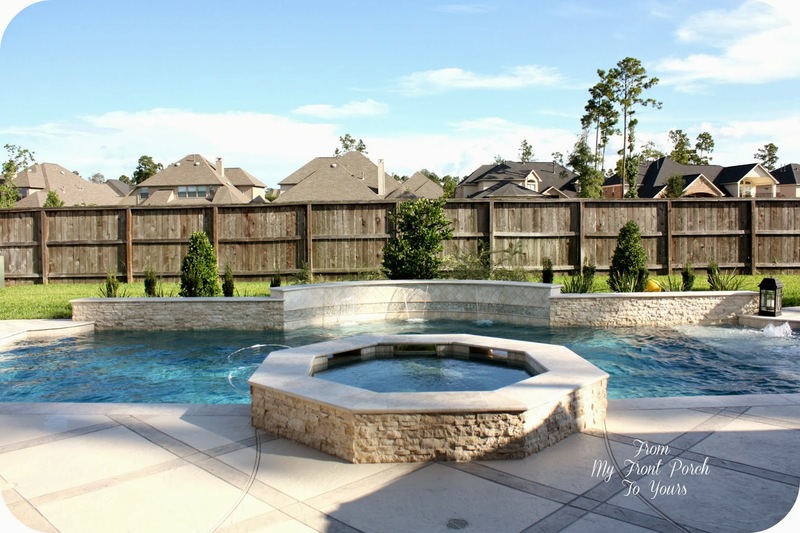 Your pool area looks amazing! You'll get to use it a ton in this Texas heat too. :) I'm sure the crepe myrtle will be fine. One of mine took awhile to adjust too, but now it's doing great. Beautiful pics! I guess you know this means I'm inviting myself over for a swim! =) The pool looks awesome! I cant wait to see how you dress up this area... I know you will do a phenomenal job! Have fun!! This is the most fabulous pool I have ever seen! It certainly is an oasis! 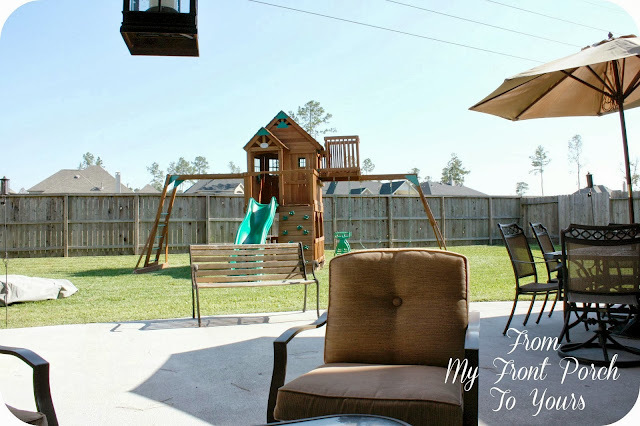 You will have years and years of backyard fun! I'll be waiting for my invitation! This is so beautiful! How my family would love, love, love to have something like this. My two oldest girls are quite the swimmers and would live in the water if I let them. 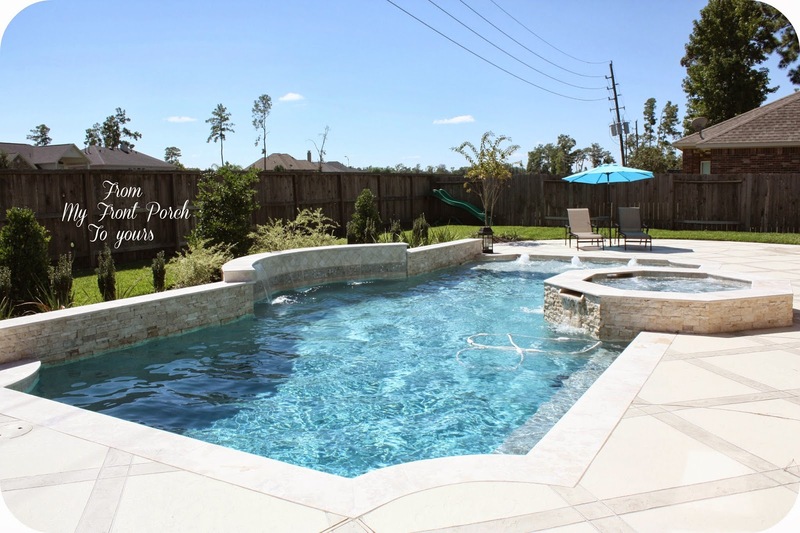 Your family will have many years of enjoyment here - congrats! Oasis is the PERFECT word - enjoy!!! Your pool and spa look absolutely wonderful! What a great time of year to be outside. The rug and other furniture will be there before you know it. Oh Wow!!! 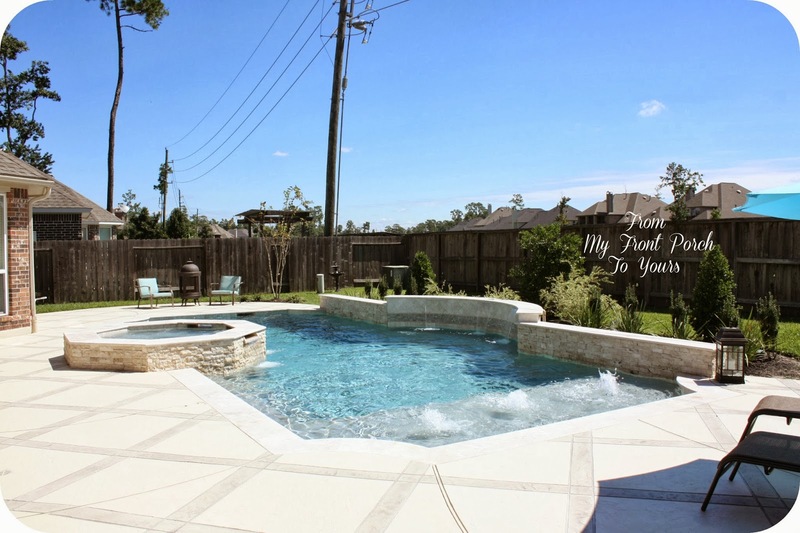 what a beautiful pool and backyard you now have Pamela!!!! So happy for you! Love all the stone work around the pool and I bet everyone is enjoying and super happy about it!!!! !Great job! 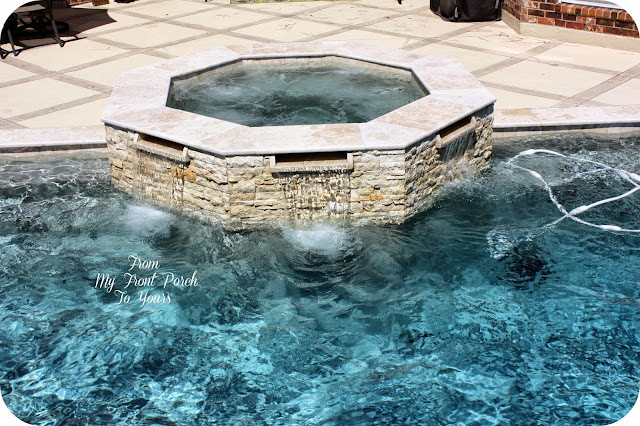 Your pool is really stunning! It must be so fun having one in the back yard and beautiful to look at too! 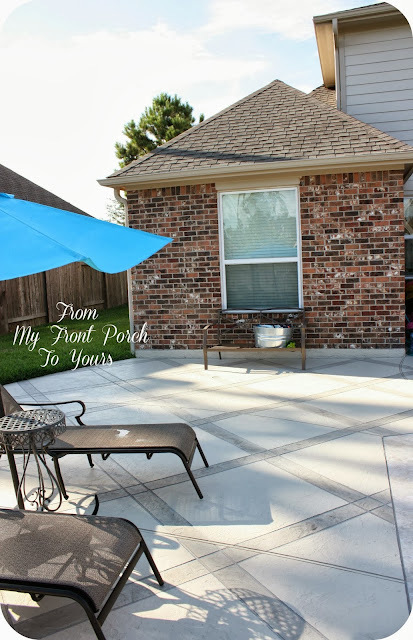 You'll get the patio looking beautiful this spring. Girl, you have been tacklin' a lot of makeovers this year! Wow...it is beautiful Pamela!!! !...you are right...it is such a fabulous oasis!!! So pretty and fun! 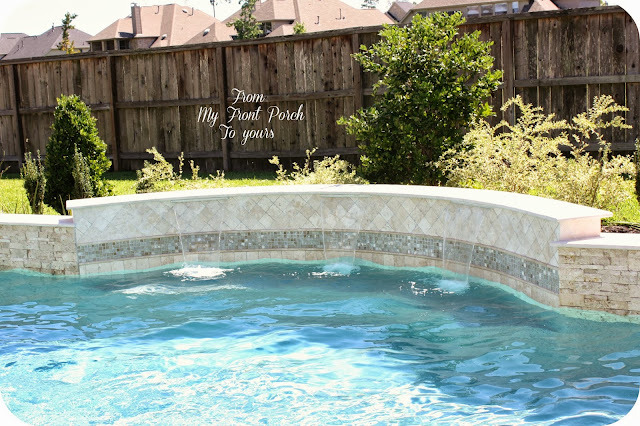 I always think as our kids get older that a pool would be a great investment. Love the shape - that water looks so crisp and clean. Congrat! it's just beautiful, Pamela, thanks for NOT waiting, so glad to see how pretty it all turned out! That is a gorgeous pool, Pamela. Wish I had one just to do laps in. So nice! I know you are loving it! I am sure you will be tweeking it forever just like your beautiful home. So keep sharing it with us as you do and enjoy! Wow your backyard looks amazing I just want to dive right into that pool! You have done a great job, I know what you mean about waiting until its all finished but it really does take time to find those finishing touches so its great you shared it with us now. You can always post some updates later on :) Enjoy your new backyard! SPLASH! It sure turned out beautifully and I know the boys just love it. What a great addition to your home. It's so pretty Pam!! Your pool area is beautiful. You did a wonderful job planning it. The stone color is a great choice. Don['t worry about your porch- who cares! You got a pool, baby!!! We loved our pool when we lived in Florida. Here in the Midwest we would only have about 2-1/2 months when we could actually use it. Gorgeous!! The pool looks amazing. Let me grab my towel, I will be right over! What a fun area for your whole family to enjoy. What a wonderful, wonderful transformation! I love the pool, the surround, the bench. That pool is amazing! I can picture your seating area with cushioned furniture and that will just be the icing on the cake. Pamela- congrats! I am sure the entire family loves staying at home now. What a great backyard retreat. I can see why you called this an oasis. It is stunning! 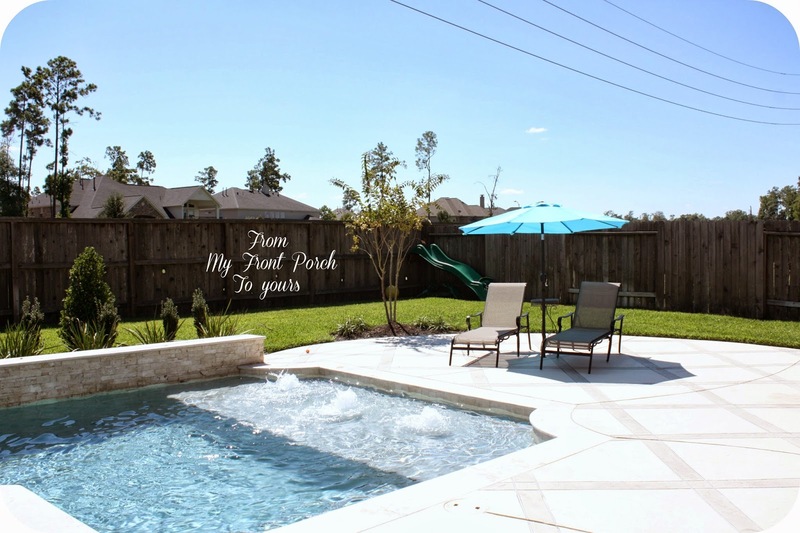 It was well worth the time and effort you have devoted to it...what an amazing back yard for your family!